Her student-teaching requirements were completed on Nov. 29, yet Nichole Flink has returned to her seventh-graders the past three days to grade their essays. She will continue until Friday, when she expects to complete all 129 essays. Nichole Flink displays the alumni pennant presented to every COE graduate. 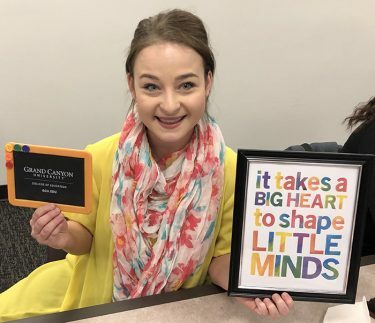 Flink’s dedication is indicative of graduates of the Grand Canyon University College of Education, who celebrated the completion of their student-teaching assignments Monday night, ahead of their graduation on Dec. 14. 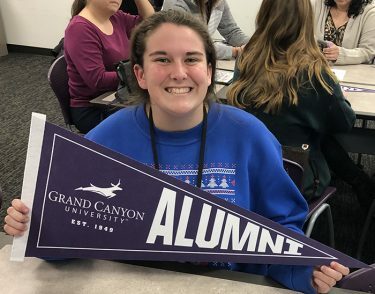 Along with LaPrade, members of the COE faculty celebrated with the 60 soon-to-be teachers by feeding them pizza and showering them with arts and crafts décor for their classrooms, GCU alumni pennants and framed inspirational wall hangings. Dr. Kimberly LaPrade, the Dean of the College of Education, congratulated the graduating teachers. Upon completing a program exit survey, Flink shared her experiences with English Language Arts students in the Gifted and Talented Education (GATE) class at Kyrene Aprende Middle School in Chandler. Flink also shifted her thinking between group work and independent work. “Part of being gifted is that some students don’t like group work as much they prefer solo work,’’ she said. As required, she put accommodations into place, facilitating solo presentations and writing on paper rather than the electronic blog on Google Classroom that was utilized by most of her students. In raising the bar, she assigned 50 pages of student choice reading per week. 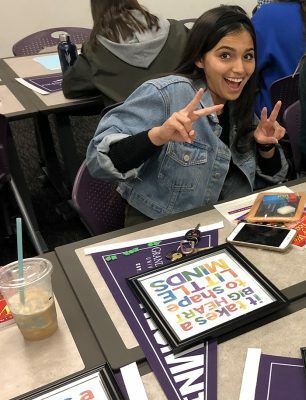 Angelica Robles shows her Lopes Up. Written essays connected to the 50 pages of reading were due every Thursday. Although the essays can be graded electronically through Google Classroom, Flink prefers to print each one and make notes on them, using symbols that indicate upper case error or pronoun error or format issue. She uses a rubric, provided by her host teacher. “We don’t want students to destroy their entire grade because of grammatical errors, so we grade in three areas: focus and organization, development of ideas, and conventions,’’ said the senior from Covina, Calif.
She surprised her host teacher by staying beyond her student-teaching time frame. “I wanted to help my students by completing the essay grading with a lot of feedback,’’ she said. Flink was modeling COE faculty, along with her peer, Sarah Schalick, who felt thoroughly prepared for her first-grade student-teaching assignment. When asked to highlight a trio of teachers who provided extra guidance, Schalick was stymied — because they all did. All of the graduating teachers and College of Education faculty. Assistant professor Paul Danuser falls into that category. The former high school English teacher prepares aspiring teachers at the secondary level, grades 6-12. On Monday, he blessed all the students with a heartfelt prayer. Schalick, an elementary education major with an endorsement in theatre, made her impact on 26 students at Field Elementary in Mesa. 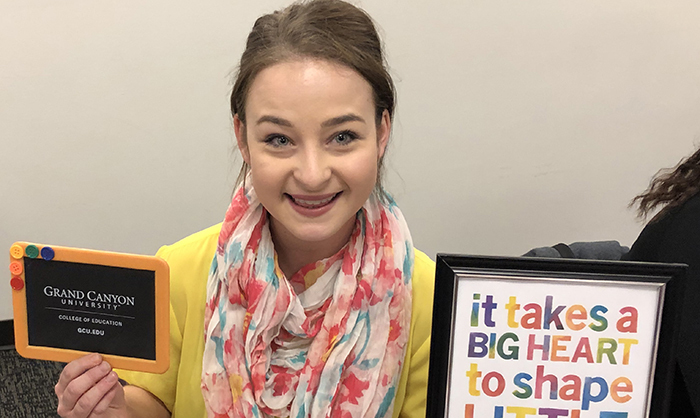 “The student-teaching experience in the fall is such a blessing to be starting with the students, because they are new and so am I,’’ she said. Sarah Schalick shows off the teacher swag she will hang in her classroom. Despite years of preparation, Schalick experienced an epiphany. “I knew teachers did a lot, and I knew how much I loved and appreciated them, but you don’t really, truly understand how much you love teachers until you have to be in the position to teach,’’ she said. Her most daunting challenge was classroom management, convincing pint-sized students to write or read or add or line up for recess. When one particularly willful child would not follow directions, Schalick explained the benefits of participating, gave him extra choices and offered positive reinforcement. Among her proudest moments was gaining the trust of her first-graders. Eugene Sanders already has a job teaching children with special needs. Eugene Sanders will apply that advice as a newly minted teacher. 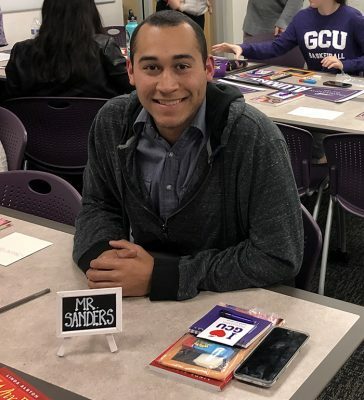 After spending the fall semester as a student-teacher of special needs at Cactus Wren Elementary in the Washington District, he will start the spring semester as the teacher of record in the same classroom at Cactus Wren. “One thing I have taken from GCU is, ‘don’t be afraid to ask for help,’’’ he said. 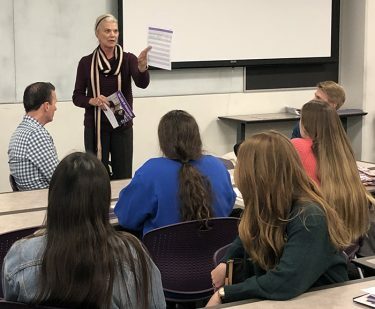 LaPrade reminded her new teachers of “The Promise’’ — a guarantee that GCU will assist any teacher graduate experiencing difficulty in their first year of teaching. It can be as simple as reaching out via email or a phone call to meeting with a faculty member to map out strategy over coffee to inviting a faculty member for a classroom observation.